The nation’s biggest deal-making firms have been revealed in the year’s first M&A league tables and there’s been a big change at the top of the table. Another of the firms to jump up the league has seen a nearly 500% increase in deal value over the same quarter last year. Gilbert + Tobin, ranked eighth in the last quarter of 2013, jumped to the top in this year's first quarter seeing the highest amount of M&A activity in terms of value. Norton Rose Fulbright also managed to recover from a dead final quarter where it ranked 47th, moving into 6th place overall representing a whopping percentage increase of 6300%. 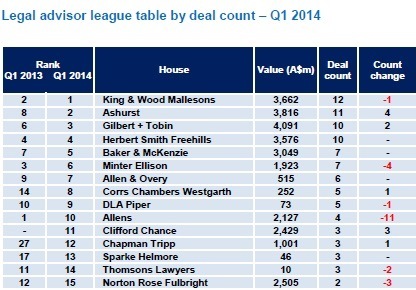 King & Wood Mallesons topped the table for the total number of deals. The value of G + T’s deals was just over $4 billion, coming from ten deals in total. In terms of overall deal value, Ashurst moved from 13th into second place (in an increase of nearly 500%) and King & Wood Mallesons came third. 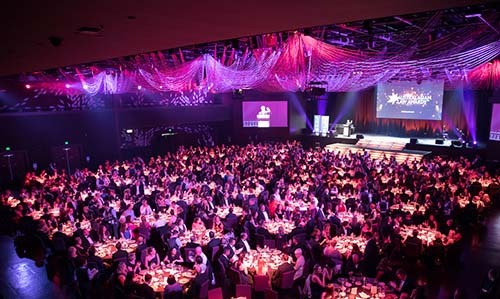 King & Wood Mallesons secured more deals than any other firm with 12 deals in total amounting $3.7 billion. 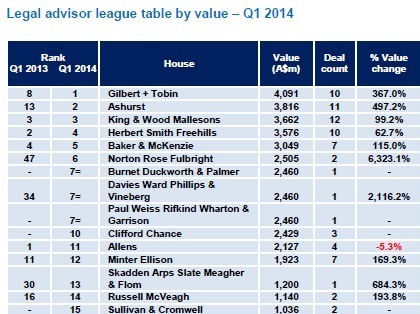 Ashurst came second with 11 deals, and G + T came third with 10. The M&A overview of 2014 so far also indicated the year began with high confidence with domestic investment being particularly strong. Domestic M&A was a busy area with deals valuing $4.5 billion in the first three months of the year, three times above the same period last year ($1.5 billion). Domestic, inbound and outbound M&A value all increased substantially from Q1 2013 levels. The Mergermarket report showed that interest in Australian infrastructure targets was high, with the largest deal in March being the $1.2 billion acquisition of a 15% stake in Leighton Holdings by the German-based construction company Hochtief. However, despite this growing interest in construction targets, energy, mining and utilities continued to dominate the quarter, accounting for 64% of all activity and for 24 deals in total.